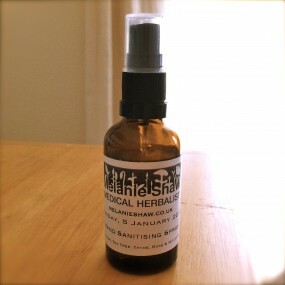 Inspired by this article I found on twitter, I decided to make my own herbal hand sanitising spray (recipe below). Stay healthy this flu season and remember always to do a 24hr patch test before using a new product on your skin, especially if it contains essential oils, which are very concentrated and can irritate the skin. Add the drops of essential oil into your spray bottle first, then add the Rose water & Witchazel. Seal the bottle and label it. Rremember: always shake the bottle well before use, to disperse the essential oils properly throughout the mixture. Melanie is based in Exeter, UK.